【TCG】TCG新闻帖 [黄金柜铁盒] [1008 SP1/SE特典/资料集合] - 第437页 - 游戏王 - Nw BBS 壬天堂世界 - Powered by Discuz! If your opponent Special Summons a monster(s) while you control no cards: You can discard this card, then target 1 face-up monster your opponent controls; this turn, that monster cannot be Tributed, or used as material for a Fusion, Synchro, Xyz, or Link Summon. You can only use this effect of "Gnomaterial" once per turn. This card can be used as a substitute for any 1 Fusion Material whose name is specifically listed on the Fusion Monster Card, but the other Fusion Material(s) must be correct. During your Main Phase, if you control this Synchro Summoned card: You can Fusion Summon 1 Fusion Monster from your Extra Deck, using monsters you control as Fusion Material, including this card. You can only use this effect of "Muddy Mudragon" once per turn. Target 1 Link Monster your opponent controls or is in their GY; draw cards equal to its Link Rating, then, if you have 2 or more cards in your hand, place 2 cards from your hand on the bottom of the Deck in any order. You can only activate 1 "Saryuja's Shackles" per turn. Discard 1 Level 5 or higher "Danger!" monster; add 1 Level 4 or lower "Danger!" monster from your Deck to your hand. 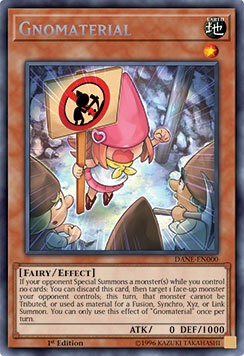 For the rest of this turn after this card resolves, you cannot Special Summon monsters, except "Danger!" monsters. You can only activate 1 "Danger! Suspense! Secrets!" per turn. Equip only to a "Danger!" monster. It gains 800 ATK/DEF. It cannot be destroyed by card effects. It can make up to 2 attacks on monsters during each Battle Phase. Reveal 3 "Danger!" monsters with different names from your Deck, your opponent randomly picks 1 for you to Special Summon, and you shuffle the rest into the Deck. During the End Phase, destroy that Special Summoned monster. You can only activate 1 "You are in Danger!" per turn. You can only control 1 "Valkyrie Erda". While you control this card that was Special Summoned by the effect of a "Valkyrie" card, all monsters your opponent controls lose 1000 ATK. Any card destroyed by battle or card effect and sent to your opponent's GY is banished instead. If all monsters you control are "Valkyrie" monsters: Target 1 "Valkyrie" monster you control in Attack Position and 1 monster your opponent controls; change your monster to Defense Position, and if you do, banish that opponent's monster. You cannot Special Summon monsters the turn you activate this card, except "Valkyrie" monsters. You can only activate 1 "Valkyrie's Embrace" per turn. If you have a Union monster in your GY: Target any number of "Valkyrie" monsters you control; those monsters can attack directly this turn, but if they do so using this effect, the battle damage inflicted to your opponent is halved. "Valkyrie" monsters you control gain 200 ATK for each of your opponent's banished monsters. If you control a "Valkyrie" monster other than "Valkyrie Funfte": You can send 1 Spell/Trap from your Deck to the GY. You can only use this effect of "Valkyrie Funfte" once per turn. While you control a "Valkyrie" monster, monsters your opponent controls with 2000 or less ATK cannot attack. If this card in your possession is destroyed by an opponent's card effect: You can Special Summon 1 Level 5 or higher "Valkyrie" monster from your hand or Deck. DELVE INTO THE DEPTHS OF DARKNESS THIS MAY IN THE Yu-Gi-Oh! TRADING CARD GAME! Dueling is set to take a dark turn in the Yu-Gi-Oh! TRADING CARD GAME (TCG), as shadows of the past collide with the umbra of untold futures. Two tremendous booster sets pit time-honored strategies against modern magic and might. First Konami Digital Entertainment, Inc. (KONAMI) presents Dark Neostorm, the second core booster set of 2019 and a new beginning for more than 30 different fan-favorite themes. Then, the battle for Speed Duel dominance continues in Speed Duel: Attack from the Deep. Joey Wheeler and Seto Kaiba reignite their storied feud, and Mako Tsunami emerges from the watery depths to join the fight. Whether you’re an Advanced Format Duelist or a Speed Dueling star, untold surprises await this May! In May, the next core booster set arrives to a thunderous debut! Dark Neostorm elevates over 30 different themes from the early days of Dueling all the way to the most modern eras. Destiny Heroes versus Dinowrestlers? Definitely. Flamvells versus Fur Hires? For sure. Maju versus Mayakashi? Madolches? Or Magical Muskets? Yes to those, and much, much more. Dark Neostorm isn’t just a blast from the past: it’s a turbo-charged tumult encompassing every era of Dueling. Xyz enthusiasts will want the new Firewall eXceed Dragon, a deadly Rank 4 made with any two Level 4 monsters. Starting with 2500 Attack Points, it revives your most powerful Link Monsters and powers up to crazy levels of ATK when it’s Linked to one or more Link Monsters. Mekk-Knights and Crusadias unite with Mekk-Knight Crusadia Avramax, a massive Link-4 that can’t be targeted and shields the rest of your monsters from attack. Hammering over Special Summoned monsters with unthinkable Attack Points, Astram strikes back with a devastating vengeance if it’s ever defeated. World Chalice fans get Ib the World Chalice Justiciar, an incredible new Synchro Monster that searches “World Legacy” cards from your Deck and replaces herself with a “World Chalice” monster when she’s sent to the Graveyard. The best part? You can use any “World Chalice” Normal Monster as a Tuner to Synchro Summon it, and Ib is a Tuner herself. Cynet Mining is a Reinforcement of the Army for Cyberse monsters, an incredible new search card for Salamangreats and more! And Link-heavy strategies will find fearsome flexibility with Amphibious Swarmship Amblowhale, a two-pronged insurance policy for your Link Monsters. Chain Hole punishes your opponent for using popular “discard” Effect Monsters like Ash Blossom & Joyous Spring or Ghost Belle & Haunted Mansion, and Dark Neostorm introduces another powerful discard with Ghost Sister & Spooky Dogwood, which gains you thousands of Life Points if your opponent dares to make Special Summons! Duelists can get a preview of Dark Neostorm at Sneak Peeks scheduled for April 27 and/or April 28 at participating Official Tournament Stores. Dark Neostorm debuts May 3 with a total of 100 new cards: 48 Commons, 20 Rares, 14 Super Rares, 10 Ultra Rares, and 8 Secret Rares. MSRP: $3.99 per 9-card Pack. The next chapter of Speed Dueling is upon us! Speed Duel: Attack from the Deep follows March’s Speed Duel: Arena of Lost Souls, introducing another five Skill Cards and 45 more cards that are new to Speed Dueling. While Yugi and Ishizu received new Skill Cards in Speed Duel: Arena of Lost Souls, it’s time for Seto Kaiba to even the score. Taking inspiration from his famous “Virus” Trap Cards, Kaiba strips powerful cards from his opponent’s Deck to sabotage their strategy. But Joey Wheeler scores a new Skill Card too! Side with the ultimate underdog and you’ll unlock the power to transcend luck once per Duel. With your back to the wall, Joey lets you choose your fate and turn the entire Duel around in one shot… Maybe. Need a new hero? Mako Tsunami crashes straight into Speed Dueling with an army dredged from the depths of the seven seas, and he’s bringing three new Skill Cards with him! Harness the destructive force of Levia-Dragon Daedalus to wash away the field, or tap into the power of The Legendary Fisherman to find the plays you need most. Speed Duelists will also find powerful cards useful for any Deck: the classic Magician of Faith lets you reuse your best Spell Cards; Blade Knight mounts solo attacks on your opponent; and Dust Tornado offers easy Spell and Trap destruction. Whatever your path in Speed Dueling may be, Speed Duel: Attack from the Deep can up your game. Speed Duel: Attack from the Deep booster set surfs into stores on May 31 with 45 cards new to Speed Dueling plus 5 new Skill Cards: 34 Commons, 8 Super Rares and 8 Ultra Rares. MSRP: $1.49 per 4-card Pack. Speed Duel Starter Decks: Ultimate Predators contain 2 ready-to-duel Speed Duel Decks including 2 Ultra Rare variant cards specially chosen to boost each strategy. Each character in Speed Duel Starter Decks: Ultimate Predators comes with 30 cards and 2 brand-new Skills each. Players will be able to adjust their Decks depending on which Skill they want to use with their character, letting you customize your strategy right out of the box! Speed Duel Starter Decks: Ultimate Predators features 2 Skills for Rex and 2 Skills for Weevil, along with an example Deck list to pair up with each Skill. Rex is ready to unleash a prehistoric rampage! His Dinosaur Kingdom gives you access to a powerful Field Spell to stomp the competition into dust, while Nightmare Sonic Blast! unlocks the true potential of his Serpent Night Dragon to wipe out your opponent’s defenses. Weevil and his Insects are as tricky as ever! Hidden Parasite will send your opponent reeling if they are unprepared, while Hyper Metamorphosis will accelerate the Summon of his Perfectly Ultimate Great Moth! Introducing the Speed Duel: Scars of Battle booster set! Upgrade your Speed Duel Decks with 45 new-to-Speed Duel cards and 5 brand-new Skill Cards! Bonz is back in town after his debut in Speed Duel: Arena of Lost Souls with a brand-new Skill. Servants of the Fallen King loads up the Graveyard with Zombies so they can rise again thanks to cards like Book of Life! Rex Raptor isn’t known for complex combos, he lets his giant Dinosaurs charge at the opponent’s face instead! The Double Evolution Pill Skill helps Rex quickly Summon massive Dinosaurs so that he can get right down to business. Crashing the party, Bandit Keith is ready to Speed Duel! Bandit Keith will be the next character to join Speed Dueling, and with him comes his army of nightmarish Machines to terrorize his opponents! Blast away your opponent’s monsters with Barrel Dragon and aggressively change the tides of battle with the boost from Metalmorph. That’s not all, Speed Duel: Scars of Battle features tons of other great cards to power up your Speed Duel Decks. Night Beam can destroy face-down Spells or Traps without giving your opponent a chance to Chain them, Dark Red Enchanter gains power for every Spell you play while punishing the opponent for holding cards in their hand, and Mask of Darkness grabs your most powerful Traps back from the Graveyard to keep your opponent off balance! GMT+8, 2019-4-26 16:27 , Processed in 0.011780 second(s), 3 queries , Redis On.